The 1-On-1 Interview Series is a special feature in the Wild Apricot Blog where we interview standout members from our Membership Advisory Group. You can join our monthly Membership Advisory calls to connect with peers in similar situations, facing similar challenges. It's a place to share ideas, work on strategies, contribute best practices, or just listen-in. In this 1-On-1 interview, we spoke with Catherine Wygant Fossett, Executive Director of the Institute for Family-Owned Business. Catherine revealed that creating member value is one of her top priorities. One of the ways she does this is by building connections between members, which she says, “can be priceless”. 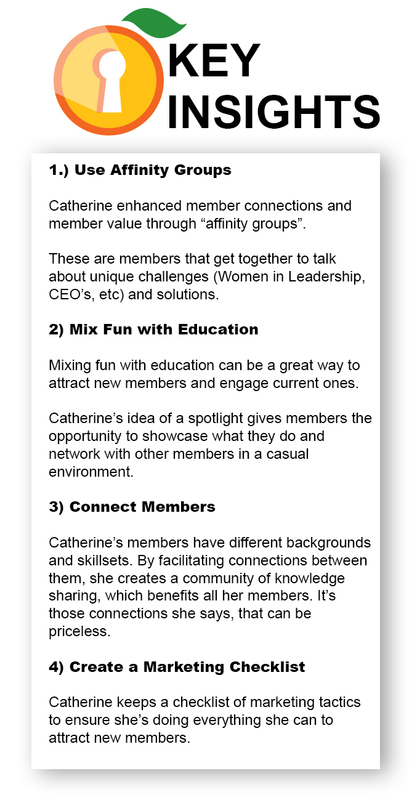 Read on to find out how Catherine uses affinity groups, education programs and networking events to build member connections or listen to the full recording below. Wild Apricot: Please tell us a little more about your organization and what you do. 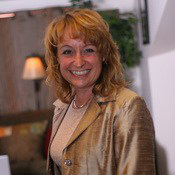 Catherine: I’m the Executive Director of the Institute for Family-Owned Business. I’ve been with them for about a year now. The Institute for Family-Owned Business is a nonprofit that provides networking and education to family businesses. Our goal is to help them succeed so they can pass it on from generation to generation. Wild Apricot: Interesting, so when people join your institute, what kind of services do you offer to them? We have CEO Central. In this, a group of CEO’s get together five times a year to talk about issues and challenges as CEO’s. Then we have a similar piece with Women’s Leadership. It’s a little bit more inspirational and we sometimes bring in outside speakers for that. We also have Women in Family Business, and then we work with the Next Generation, which is the generation that’s going to be taking over the business from the previous generation. Wild Apricot: How do you organize networking events for members? Catherine: I created a family business spotlight, where we spotlight a business on our website, in emails, ads, and social media promotions. This lets you learn other things about family businesses you wouldn’t otherwise know. We have a spotlight coming up on Monday where we have a seating company that is in its sixth generation. We’re going to have an after hours event and invite people to play musical chairs. They’ll hear from the company and go to the product showroom and see what they have. So we’re giving insight into the family business and having a bit of fun illustrating what they do. Wild Apricot: Yeah, I think that’s a really good tactic to combine fun with education, because sometimes when it’s all business, it’s not as fun. Catherine: That inspiration came from one of your seminars, Revolutionize your Meetings & Events, when you suggested doing something different. Wild Apricot: That’s great, we love hearing that! Wild Apricot: Tell us a bit more about your education programs. Catherine: We’re going to do one on HR for the family business, then we’re doing a team building one as well. Then we have a holiday social and a big awards night. We get a lot of support from our associate partner members, who include lawyers, bankers, and accountants, because 80% are Family-Owned and if a family business stays in Maine and passes it onto the next generation, then that helps our economy. Wild Apricot: All this sharing of knowledge and succession planning and insights, how do you capture it all and share it with members who can’t attend these events or are curious to get involved with your organization. Catherine: Well today we made a test of it. We had an event that we filmed live. We might also have it made into a transcript that we can then share. I’d like to create a login to our website and also make available articles from our governance leadership forum, the Harvard Business Review, and other tidbits of info that come up from the sessions I go to. I want to make that information available to members to provide them with more value. Wild Apricot: What is your strategy for bringing in new members? Catherine: I love what I do and I’m always prospecting. I have 3,000 names in the database for emails and another direct mail list. I also have relationships with media partners that I do sponsorships with. They’ll do print ads, or online ads and then we have a number of programs with other outlets. I have a whole checklist of things I go through when I promote. I put it on Facebook and I put it on calendars and I put it in a press release. And then I have a PR person. A lot of times businesses don’t know about our award program and the nominations come from press, articles, promotions or things we’ve put out because we’re doing a call out for nominations. They go through the process and then we learn about them and they learn about us and hopefully they become members of the institute. Wild Apricot: I think the awards program is a brilliant strategy actually to get new members in. Catherine: I can’t take credit for it, they were already doing it but I think it’s a great way to bring people in. Wild Apricot: Thank you for joining us, it was great to talk to you and so great to learn about all the different programs you have. I think there’s a ton of great ideas and lessons we can share. Catherine: And I’m happy to help, I’m happy to share things. That's how you learn and grow. Want to listen to the full 1-On-1 Interview? Catherine goes into much more detail on her strategies for engaging members and some of the events she’s organized. Listen to the full interview below.